Evicting a tenant is never fun, and seldom easy. But it is a necessary evil, and an integral part of property management. 1. Handling the process alone. Pursuing an eviction requires a breadth of knowledge — from understanding the law, to the specific rules of the eviction judge, right down to figuring out where to park so you are not late for your hearing. 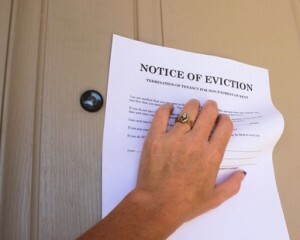 Landlords have a heavy burden in eviction courts, which often are viewed as tenant-friendly. If notices and other court documents are deficient or evidence is not presented properly, the case may be dismissed. Re-filing the eviction paperwork will trigger a longer wait, and cost both money and time while the property is not bringing in any rent. Unless you familiar with the local eviction process, considering hiring an experienced eviction attorney to streamline the process, at least the first time around. 2. Not having an accurate list of occupants. If tenants have moved in or out, you don’t have full legal names of the occupants, or if minor children have turned 18 during the lease term, you could have trouble getting possession of your property. All adult occupants should be properly named in the eviction paperwork. Otherwise, the order for possession you receive from the court may be defective, and that will slow down the ability of the sheriff to serve the order. No service means no move out is scheduled, and further legal action may be required to correct the error. 3. Not gathering enough information in the rental application to locate the tenant’s assets. Once you gain possession of the property, you can put it back in service. But if you are also out money for lost rent or damage, you’ll want to collect against the tenants’ assets. That means tracking down those assets. Personal references, employment information, banking information and tax returns — the information requested in the rental application — can reveal patterns that will lead a debt collector straight to your ex-tenant’s new front door. Without it, you may be stuck in the dark. 4. Not tracking repairs and maintenance. One of the most common defenses tenants raise in an eviction case is the condition of the property. The reason: they know they can get a sympathetic judge to reduce the amount of rent owed, offset security deposit deductions, or get the case dismissed altogether. Don’t be blindsided. Keep contemporaneous records of the condition of the unit, starting with the move-in condition report. Have a system in place for repair requests, and add any requests made by the tenant to the file. Make a note of any routine maintenance performed on the property. Keeping up with repairs throughout the tenancy is necessary to avoid claims by tenants that the property was neglected. 5. Getting emotional. Showing emotion, especially at the eviction hearing, plays right into a bad tenant’s hands. They will twist it to show that they’ve been mistreated. Stay professional at all times when dealing with bad tenants, and to the extent possible, divorce yourself from the stress of the eviction process. Don’t allow frustration to allow you be become short with any court staff or other officials. It may help diffuse the emotion if you keep in mind that the tenant is the one who ultimately will suffer the most from the eviction. An eviction will injure the tenant’s credit and rental history, hampering their ability to rent the homes of their choice, for years to come — long after you’ve recovered your rental property. That is assuming, of course, that the new landlords will take the time to screen the tenant.